The holiday season is the worst time of year to have a sick child. There are so many fun holiday activities going on and it's really a bummer when you have to miss them because one of your kids is sick. At our house the living room, and more specifically the couch, turn into my sick kid command center and I want to keep everything I need at hand. It's the worst to need something in the middle of the night to help your sick child and you can't find it. The worst! 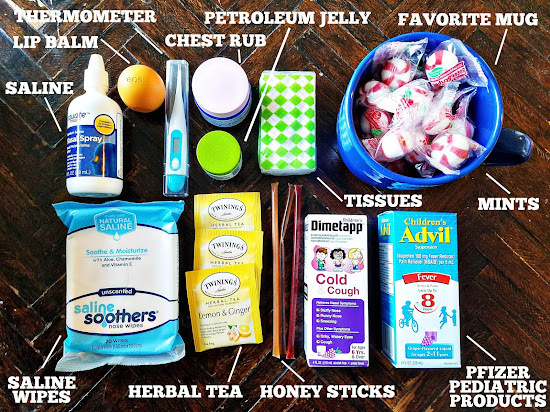 That's why before cold and flu season I put together my Mom's Sick Kid Command Center Kit! That way I have all the the survival basics that I need for when the sickies hit one of my kids. We've already had one man down this holiday season and I was so glad that I had everything I needed right at hand to keep her comfortable and myself sane! I keep everything for my SICK KID COMMAND CENTER KIT in a basket near my command center - aka the couch. No more rummaging around in my bathroom by flashlight in the middle of the night for the thermometer so I don't disturb my husband. It's all together in one spot and right where I need it. I always include my favorite Pfizer Pediatric Products that offer symptom relief for kids as young as 2 and up to 11. That is exactly our age range at home. Children’s Advil® is perfect for Grace. Its comes in several great-tasting flavors, including Sugar-free Dye-free Berry, Bubble Gum, Grape, Blue Raspberry, Fruit and Dye-Free White Grape flavors. She loves Grape and I appreciate that it alleviates the achy body feeling she gets when she's sick. We also use Children’s Dimetapp® Cold and Cough to tackle the most bothersome stuffy and runny noses, all while working to relieve a cough, for ages 6 and up and the big kids like the yummy grape flavor. 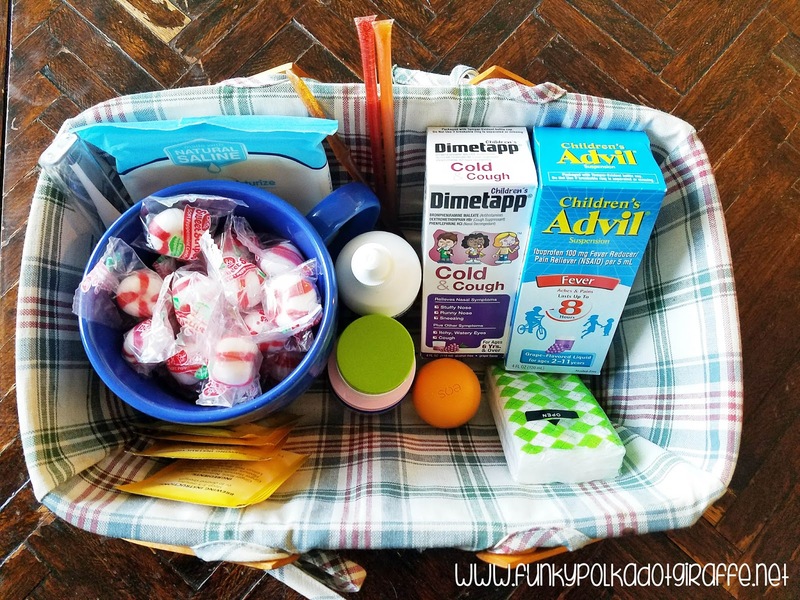 WHAT DO YOU KEEP IN YOUR SICK KID COMMAND CENTER KIT? HOW DO YOU SURVIVE COLD AND FLU SEASON? 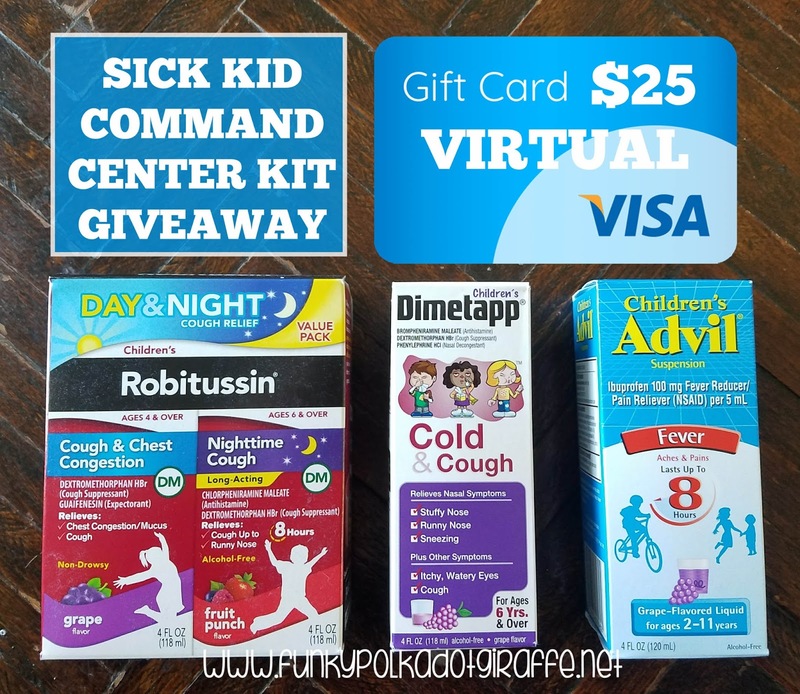 And because I like you all so much I am giving away a SICK KID COMMAND CENTER STARTER KIT to get you started! Yay! Be sure to enter below! I read labels on over-the-counter medications and treat the symptoms, get a lot of rest and down plenty of fluids! I also sanitize door knobs, faucet handles and light switches. We stock up on medication, tissue and chicken noodle soup. 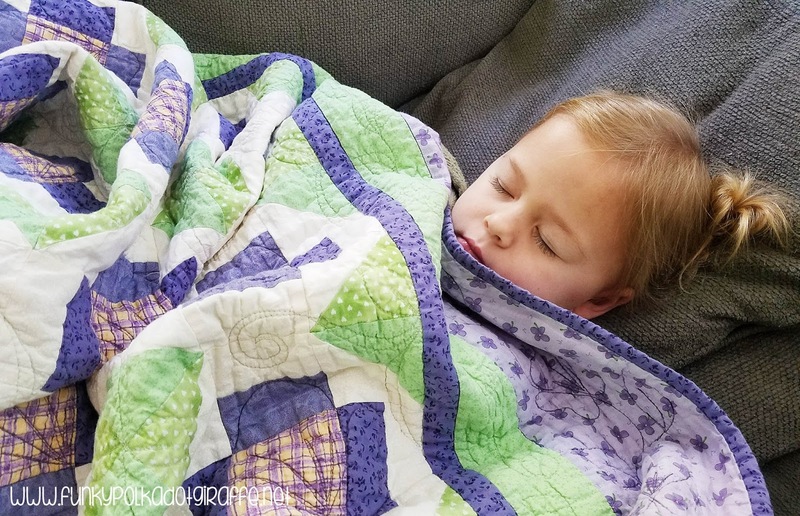 The kids love to snuggle up with a cozy blanket and watch a movie. I have my kids get extra rest and fluids. We wash our hands all the time, eat healthy, get plenty of sleep and drink a lot of water to keep from getting sick. We also use hand sanitizers. We take meds with a lot of rest to help. I stock up on cold medicine and tissues. I get through it with extra rest, lots of soup and water to stay hydrated, tissues and meds. Lots of cold meds, fluids, soup, and netflex. Ugh I'm sick myself now, that's tough to answer, my kids are sniffling and coughing but no fever, so that's good. How do we do this? Time and some medicine help. We survive by getting lots of rest! I always keep some frozen chicken in the freezer so I can make a pot of chicken soup on any day. Advil and sleep plus lots of fluids to start. I make sure to regularly disinfect my house and wash my hands regularly. I stock up on soup and medication. When sick gets real I use Children's Advil. I try my best to make them feel as comfortable as possible and maybe give them some fun games that they can do while sick or put on a good movie for them. We survive cold and flu season by stocking up on Ricola and tissues, trying to be flexible with plans, lots of cuddles and relaxing if/when someone gets sick and by drinking lots of water to avoid getting as sick (hopefully!). We survive cold and flu season by taking our vitamins, using saline nasal spray and by washing our hands a lot. We drink lots of fluids and get lots of rest. I survive by washing my hands a lot and trying to keep the germs away somehow. When sick gets real, we try to get plenty of rest, liquids and medicine. Thanks for the chance to win such an amazing giveaway and Happy Holidays!! !.